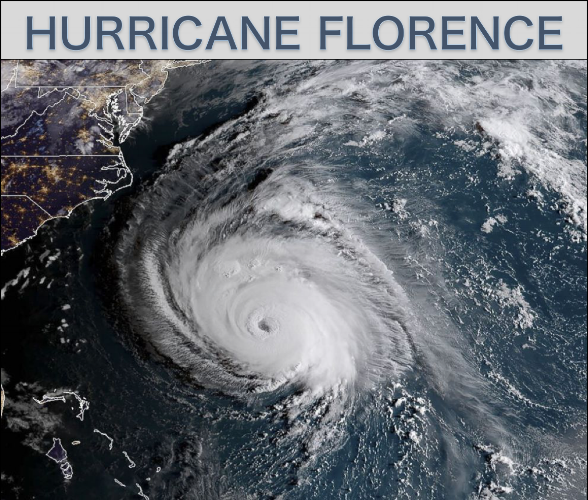 Hurricane Florence is gradually making its way towards the East Coast mainland and is expected to make landfall late Thursday night/early Friday morning around the Carolinas. W. Derrick Lea, NAD ACS DR Director, met with the directors and coordinators of the Southern and Columbia Unions and some of the Conferences under the respective Unions: Carolina, South Atlantic, Allegheny East, Chesapeake, Potomac, and New Jersey. Our ACS DR Teams in the mentioned conferences appear positioned well. They have developed a plan of action for this type of a crisis event. Flood buckets are in place throughout each State that is in danger. Personal care kits are available and ready for use. Warehousing agreements are in place and our teams await the exact location for operations to begin. Some conferences that may not take a direct hit as anticipated earlier, are on standby to assist with the Recovery Efforts. We continue to have conversation with the State, American Red Cross, and ADRA as to how we might work in concert as Recovery begins. Please keep our ACS DR teams and each of the communities that will be affected in your prayers. On September 11, W. Derrick Lea, NAD ACS Disaster Response Director, joined Thierry Van Bignoot, ADRA International Emergency Management Director, on Washington DC's Great Day Washington and WUSA 9 to discuss disaster preparedness. Watch the video for tips on what you need to survive in the event of an emergency.